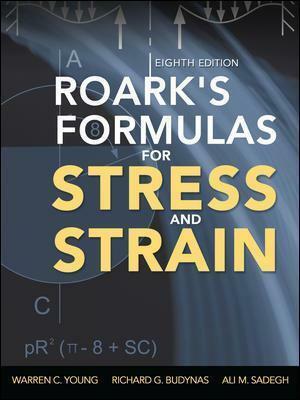 THE MOST COMPLETE, UP-TO-DATE GUIDE TO STRESS AND STRAIN FORMULASFully revised throughout, Roark's Formulas for Stress and Strain, Eighth Edition, provides accurate and thorough tabulated formulations that can be applied to the stress analysis of a comprehensive range of structural components. All equations and diagrams of structural properties are presented in an easy-to-use, thumb, through format. This extensively updated edition contains new chapters on fatigue and fracture mechanics, stresses in fasteners and joints, composite materials, and biomechanics. Several chapters have been expanded and new topics have been added. Each chapter now concludes with a summary of tables and formulas for ease of reference. This is the definitive resource for designers, engineers, and analysts who need to calculate stress and strain management. Richard G. Budynas is Professor Emeritus of the Kate Gleason College of Engineering at Rochester Institute of Technology. He has over 40 years experience in teaching and practicing mechanical engineering design. He is the author of a McGraw-Hill textbook, Advanced Strength and Applied Stress Analysis, Second Edition; and co-author of a McGraw-Hill reference book, Roark's Formulas for Stress and Strain, Seventh Edition. He was awarded the BME of Union College, MSME of the University of Rochester, and the Ph.D. of the University of Massachusetts. He is a licensed Professional Engineer in the state of New York.